Each week, The Rebel Walk’s Jeff Tetrick takes a look at the Ole Miss Postgame Points, examining five takeaways from the Rebels’ most recent football game. Here are his Postgame Points from the game against Auburn. 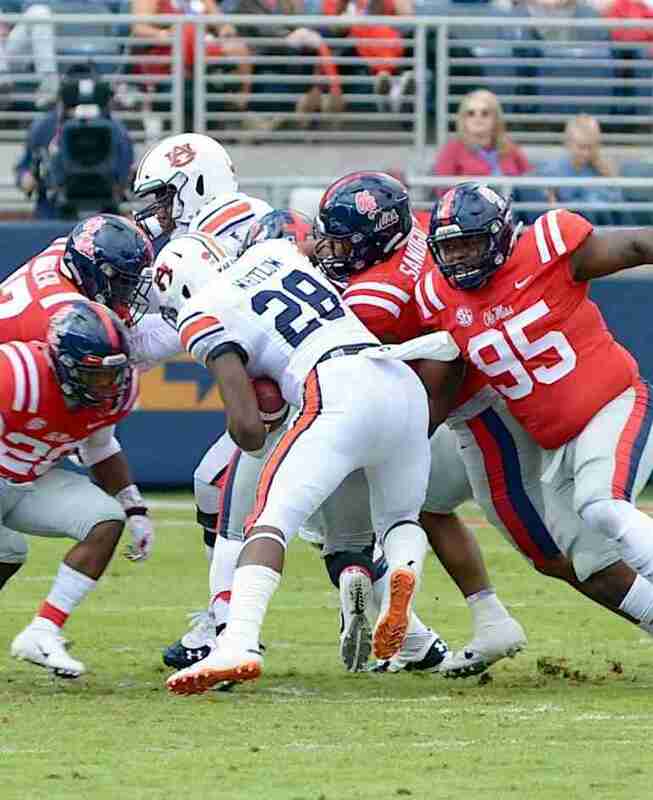 Ole Miss fell to Auburn 31-16 on Saturday afternoon at Vaught-Hemingway Stadium. The Rebels sit at 5-3 overall, 1-3 in the SEC heading into the bye week. The Rebels have an extra week to rest and prepare for a visit from South Carolina to begin the November portion of the schedule. Ole Miss had opportunities to make this a competitive game, but the Rebels could not take advantage of their chances. The Rebels were in the red zone four times against the Tigers. Ole Miss scored a touchdown and three field goals in the red zone to account for all sixteen Rebel points in the game. It is critical to get points in the red zone, but the majority of those scores need to be touchdowns to win SEC games. As well, Ole Miss left points on the field when an opening drive field goal attempt was blocked by Auburn. If the Rebels had converted that field goal attempt and scored touchdowns in the red zone, this game could have gone in favor of Ole Miss. Junior wide receiver A. J. Brown had a huge game against Auburn. The Starkville, Miss. native caught 10 passes from Jordan Ta’amu for 155 yards and 1 touchdown. For the season, Brown has caught 60 passes for 805 yards and 5 touchdowns. Brown continues moving up in the Ole Miss record books and has three 100-yard receiving games this fall after his effort on Saturday. He stands second in the Ole Miss history books with nine 100-yard receiving games in his career. Brown sits third in the record books at Ole Miss with 2,469 receiving yards. With 164 career receptions, Brown ranks fourth in Ole Miss history. Finally, A. J. has 18 touchdown receptions as a Rebel, which currently ranks fifth all-time at Ole Miss. Ole Miss punted just four times against Auburn, but sophomore punter Mac Brown and the punt coverage unit were on top of their game. 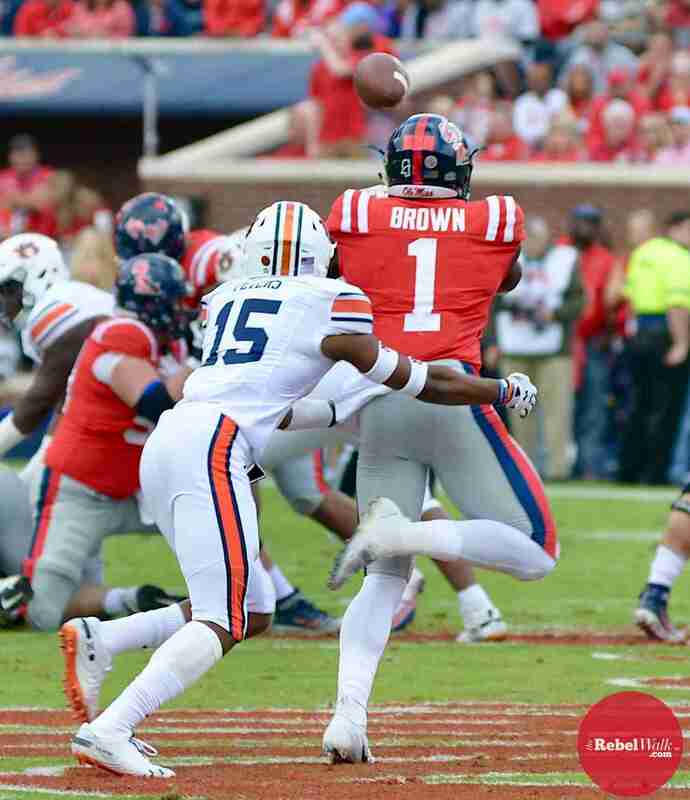 Two of Brown’s punts were downed inside the 20-yard line by the Rebels, while a third punt was a fair catch by Auburn. The only punt return made by the Tigers went for a gain of just 4 yards. Linebacker Mohamed Sanogo had a big day on defense against Auburn. The sophomore from Texas was all over the field making plays and doing his best to keep the Rebels in the game. 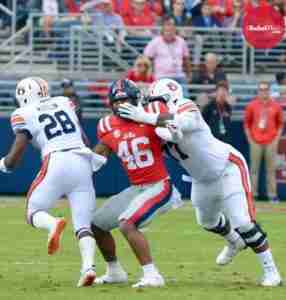 Sanogo finished the day with a career-best 16 tackles, the most tackles recorded by an Ole Miss Rebel since Tony Fien had 16 takedowns against Auburn back in 2007. Sanogo has paced the Rebels in tackles in four of eight contests this fall. He leads the team with 65 tackles this season and has emerged as a promising young leader on the defensive side of the ball. Sanogo has 2.5 tackles for loss, 1 quarterback hurry, and 2 forced fumbles to his credit, as well. Turnovers do not win or lose games, but they do create or eliminate scoring opportunities. The Rebel defense did not record a takeaway for just the second time this season, snapping a streak of six straight games with a takeaway. On the other hand, the Rebel offense did not commit a turnover against Auburn. It marks the third time this year that Ole Miss has not given the ball away in a game. The result of taking care of the ball is that the Rebels got into the red zone four times and had a makeable field goal attempt early in the game just outside of the red zone. Ole Miss was unable to convert those scoring chances into enough points to win the game, but by taking care of the ball, the Rebels had those opportunities. For the season, Ole Miss quietly sits 30th in the country in turnover margin. The Rebels have created 12 takeaways while turning the ball over just 7 times. Again, turnovers do not win or lose games, but they do give or take away scoring chances. Ole Miss has done an excellent job in this category all season. Hotty Toddy! Jeff is a college sports fanatic who was able to recognize many D1 team logos by kindergarten. Growing up, Jeff played football, baseball, basketball, and ran track/cross country. Jeff’s love for college sports was expanded while running track/cross country at Indiana University, where he earned a General Education degree and attended every sporting event possible when not running for the Hoosiers. A proud parent and husband, Jeff resides in Oxford. His wife is an Ole Miss graduate, and Jeff has a year of post-graduate studies at Ole Miss under his belt. Jeff and his family can be found at just about any Ole Miss sporting event throughout the year. Jeff follows the idea of God, Family/Friends, and Football as a way of life. Writing about Ole Miss sports plays to Jeff’s love affair with collegiate athletics perfectly!